His 2nd birthday started off much better than his first! He had the biggest smile all day, but he took his hat very seriously. 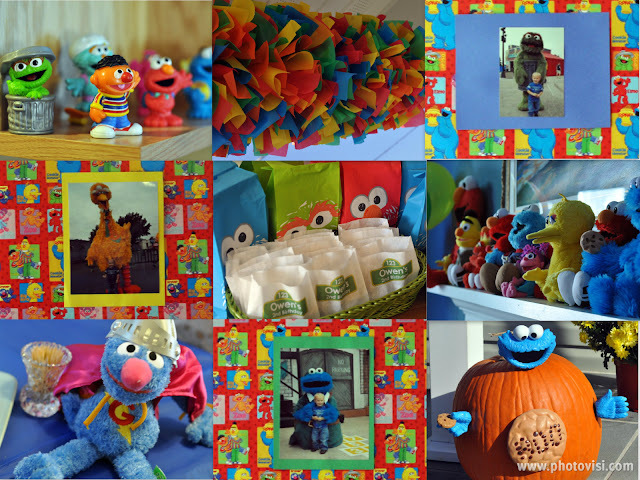 It was easy to decide on a Sesame Street party theme because we are not only fans of the show, but we visit Sesame Place as often as possible. We have also collected more than enough Sesame toys over the years, which made decorating super easy! We covered the paintings that usually hang on our walls with Sesame wrapping paper and placed pictures of O with his favorite characters on them. Outside, we used a Cookie Monster pumpkin kit to go with our regular Halloween decorations, and I hung streamers made from shreaded plastic tablecloths in the party colors. 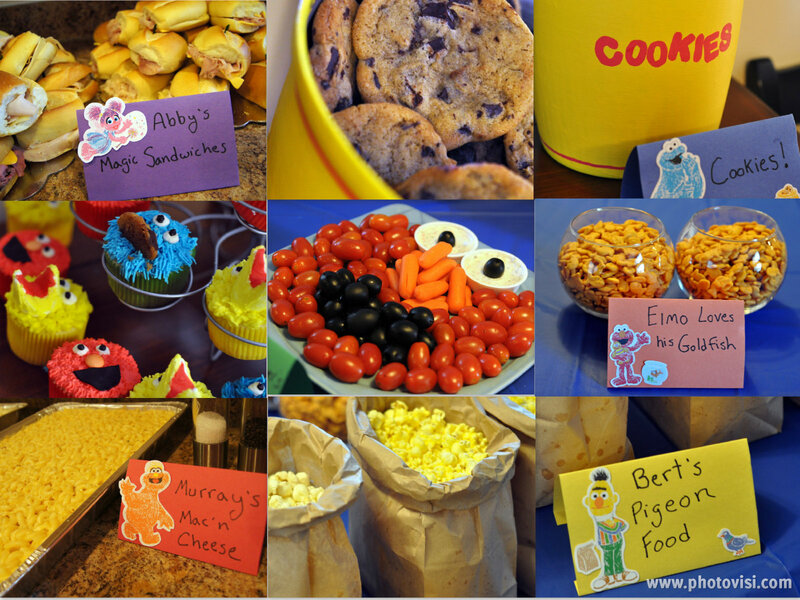 For favors, I used Sesame lunch bags to package cookies, goldfish, and a small Elmo book for the kids. Adults got to take an extra cookie home in personalized wrappers from Little Beane Boutique. After displaying our Sesame stuffed animals and toys on the mantle and shelves, our house was ready! I knew better than to take on too much in the food department- that stressed me out when I wasnt working full time! I had a local Italian market deliver sandwiches and salads, and I only had to set out snacks and veggies. A former favorite student of mine has a baking business (& an awesome blog), and I was so excited to hire her to make the treats! I made the replica of Cookie Monster's cookie jar from a stainless steel trash can. Stainless steel is not as easy to paint as the guy at Michael's made it sound, but after 20 coats, I was happy with it. Suzanne was such a huge help! Getting blog-worthy pics is always easier when there is another blogger at the party. Last year, there was a snowstorm the weekend of O's birthday party, so we majorly lucked out with the GORGEOUS weather last weekend! I didn't even get to decorate with these because O insisted on carrying them around and passing them out. He had to sleep with one that night, too.